Ben, Scott, Luke, Eric, Brian and Steve. A huge thanks to JRA Bike Shop (8310 8th Ave NW) in Seattle! They answered my Craigslist post requesting a much needed spare part (freehub body). Upon arrival, they fixed us right up and had us on our way inside of an hour. Owners Eric and Ben have had a space at Seattle’s Bike Station in Pioneer Square since Feb 08. They opened their “real” shop on 8th Ave NW in March 09. 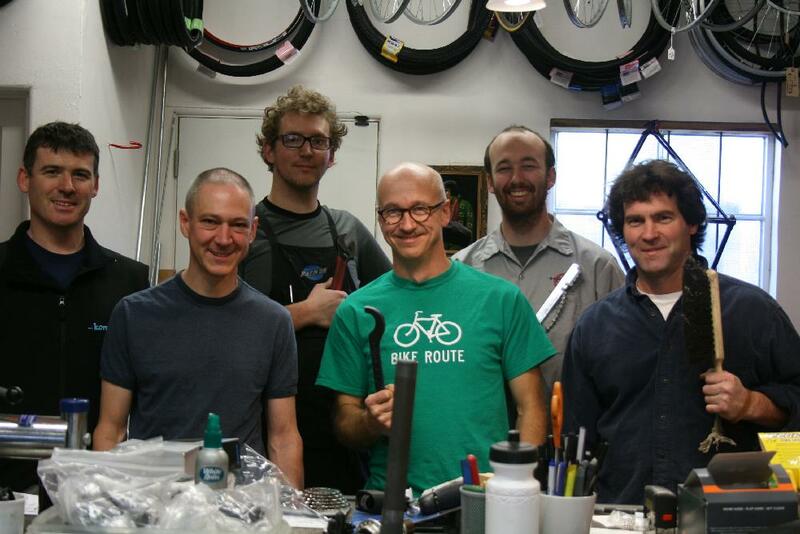 They strive to be the neighborhood bike shop for the Ballard-Greenwood area and get as many people riding as possible. They’ve got a good assortment of new and used, and their mechanical prowess is top notch. Thanks for keeping us pedaling southward! JRA is bike mechanic’s parlance for Just Riding Along. Your average client, upon entering a bike shop, will typically say something like: “I was just riding along when suddenly my wheel exploded.” This masks the cause of the problem, which usually stems from the rider’s negligence. The mechanical diagnosis becomes “JRA”, meaning can-of-worms guesswork.